Welcome to the world of "VANAKKAM". Take a moment to scroll down and find out what the first two parts of the Vanakkam Trilogy "Vanakkam - No Way Back" and "Vanakkam - No Regret" are all about. Get to know the author and find out what she has been up to since the presentation of "Vanakkam - No Way Back" on 16th September 2016. The presentation of "Vanakkam - No Regrets" was on 23rd November 2018. See Kommende Anlässe for all upcoming events. For those who want to buy the books in Switzerland, they are available in various bookshops (exlibris.ch) or go to Shop and place your order. 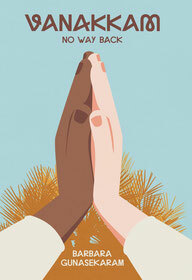 If you are living outside of Switzerland, please order in Shop or online through Book Depository, amazon.com. Thank you for your interest and have fun reading! Vanakkam is the traditional form of greeting in the Tamil culture. When meeting somebody, the hands are pressed together and a discrete nod of the head serves as a sign of recognition and respect. This novel is based on true-life experiences. It is the story of two people of totally different backgrounds struggling to make their life together work. At various times during their married life both Parthee and Stephanie regretted not having chosen partners from their own cultures. While they were struggling to resolve their personal conflicts, the civil war in Parthee’s old homeland Sri Lanka was raging. Every day there was news of more death and destruction inflicted on the innocent civilians in the north of Sri Lanka. Parthee’s continual concern and anxiety about the safety of his relatives put an extra strain on their young family life in Switzerland. At the same time Stephanie had her own battles to fight. She could not let go of the painful memories and issues from her past life in Australia. 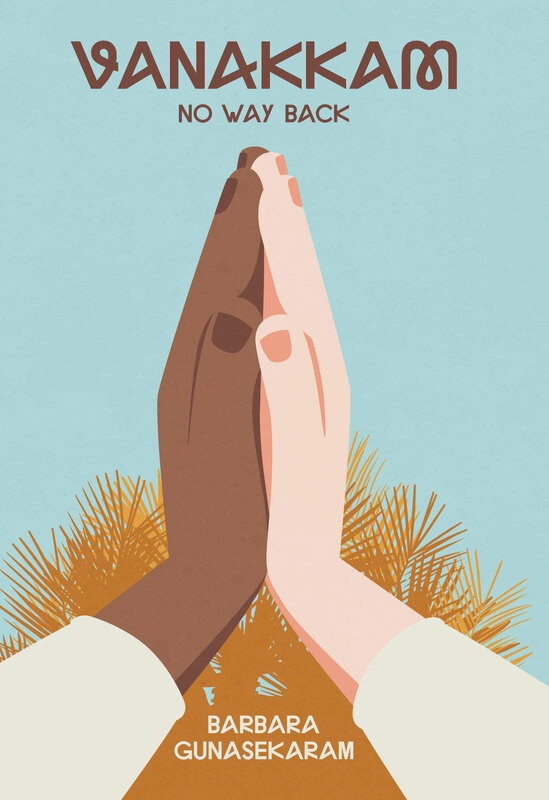 Even more so, after all the disappointments and times of despair that she had experienced as a child, she was determined to make her own marriage work. But there was so much about her husband she did not understand. Both Parthee and Stephanie had to undertake separate voyages to the countries of their pasts and one important journey together as a family to rediscover their love for each other. "Vanakkam - No Regrets" is the second part of the "Vanakkam" trilogy, but can be read seperately from "Vanakkam - No Way Back". The third "Vanakkam" novel is planned for 2020. “Vanakkam – No way back” is a story of freedom and love portraying the journeys of two young people and experiences of fateful encounters. Stephanie leaves her homeland Australia in search of inner peace - Parthee is forced to flee from his Sri Lankan paradise due to a terrible civil conflict. The tracks they take lead them through trials of emotional and physical endeavour, during which they never lose respect and finally entwine in a way they had never thought possible. Eighteen-year-old Parthee must leave his beloved island paradise Sri Lanka due to a gruesome civil war. His ardous journey to Europe, where he hopes to find salvage, is paved with many difficult, often frightful, sometimes adventurous experiences; feelings of raw homesickness and dark fear continuously clutching at his heart. Seventeen-year-old Stephanie has her own reasons for leaving her homeland Australia. Partly a lust for adventure, but mostly a need to eascape her troubled and broken family prompt her to take a chance and travel to the home country of her parents, Switzerland, in hope of finding peace. There she meets Parthee, an encounter which should change her life forever. "The story Vanakkam - No Way Back is authentic, heart-wrenching and written with much empathy and sensitivity; a delight to read." Barbara Gunasekaram was born in Australia in 1967. 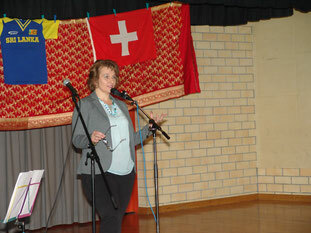 For most of her adult life she has lived in Switzerland finally settling in Zug with her husband and three children. 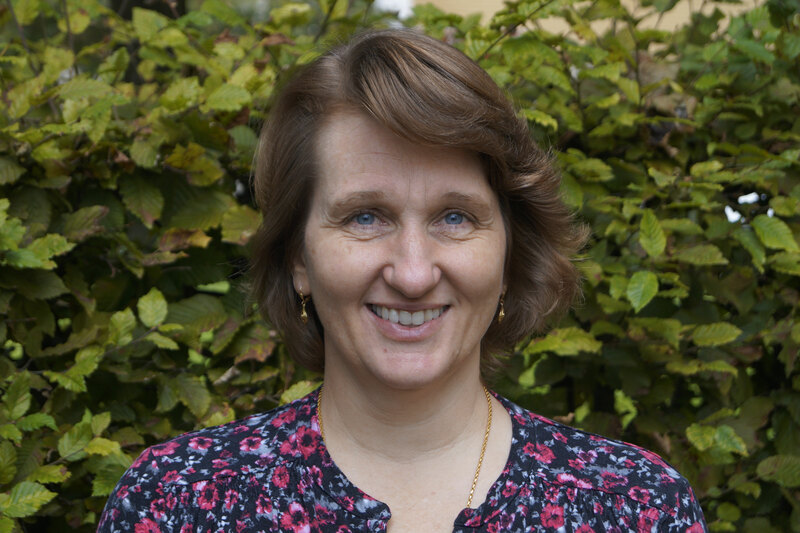 As well as being a passionate writer, she also love being a mother and wife, working as a playgroup teacher and spending time in her garden and in nature. 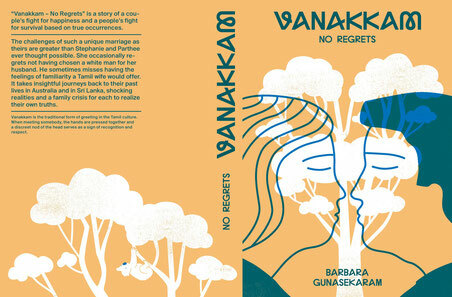 “Vanakkam – No Way Back” is Barbara Gunasekaram's first novel, "Vanakkam - No Regrets" the sequel, but can be read individually. Both novels are also available in German. DEBUT OF "VANAKKAM - NO WAY BACK"
The parish hall of St. Johannes church in Zug very quickly filled up with a large number of friends, neighbours, relatives and other interested people. Barbara Gunasekaram presented her debut novel „Vanakkam – No Way Back“. The book, written in novel form and based on a true story of two young people who are forced to travel across the continents from their home countries Australia and Sri Lanka in search of peace and security, eventually finding a safe harbour in an unexpected place. Barbara read passages of war, homesickness, tragedy, longing, adventure and love, the words dancing around the room as the evening unfolded. The texts read by the author were accentuated by expressive Tamil dances and songs from three continents – a colourful, inspiring programme. Unbelievable! The parish hall was packed to the brim with over 200 people who had come to see me and to get to know my book. I had expected no more than 50!! During the next 90 minutes the guests were swept away on a magic carpet ride of moving words, fantastic colours and exotic tunes. They were seized with wonder at the sight of the two Tamil dances and the sound of the melodious Tamil song and lyrically haunting Irish and Australian songs sung by my two daughters accentuating the passages read from my book. During the whole very moving presentation, the sound of tissues being taken out of bags in order to wipe away tears of pleasure and tears of sympathy could be heard rustling through the audience. Afterwards the guests were invited to enjoy a fabulous Apéro-Buffet of curry-rolls, cutlets, pappadam and keseri from Sri Lanka, chocolate-chip-cookies made (by me) from an Australian recipe, traditionally Swiss biscuits and ham croissants and litres of wine, mineral water and orange juice. Good thing my husband, who made the buffet, always cooks and buys too much. At the end there was not one crumb left over! I had no chance to enjoy any of the Apéro. The queue of people standing in line to buy a book from my son, who was cashier for the night, and then coming to me for a dedication, just grew and grew. When finally I signed my name in the last book, it was almost 11.00 p.m. and the hall was nearly empty. The whole evening had been a truly overwhelming and successful experience for me. Thank you to all.